Every day, Watch This offers staff recommendations inspired by a new movie coming out that week. This week: With the Oscars airing on Sunday, we look back at Best Picture nominees that should have won. One of the reasons so many serious cinephiles hate the Academy Awards is that they turn movies into racing horses, to be betted on and pitted against each other in pointless contests of merit. Art, the Oscar haters remind, is not a zero-sum game. All that being said, sometimes stacking one thing against another can help you sort out your sensibilities and figure out what you truly value. The Oscars provide that annual opportunity, never more so then when the Best Picture lineup lumps together something big and flashy and populist with something small and gritty and idiosyncratic. The 1962 ceremony offered one such pairing, when Robert Rossen’s tough gambling drama The Hustler took on the unstoppable juggernaut that was West Side Story. Not that it was much of a competition: A high-grossing Broadway transplant that won 10 of the 11 awards for which it was nominated—a record for a musical—West Side Story cleaned house. And in some ways, it wasn’t so different from The Hustler: Both films are adaptations, shot and (primarily) set in New York City, with doomed love stories at their centers and tragedy at their ends. 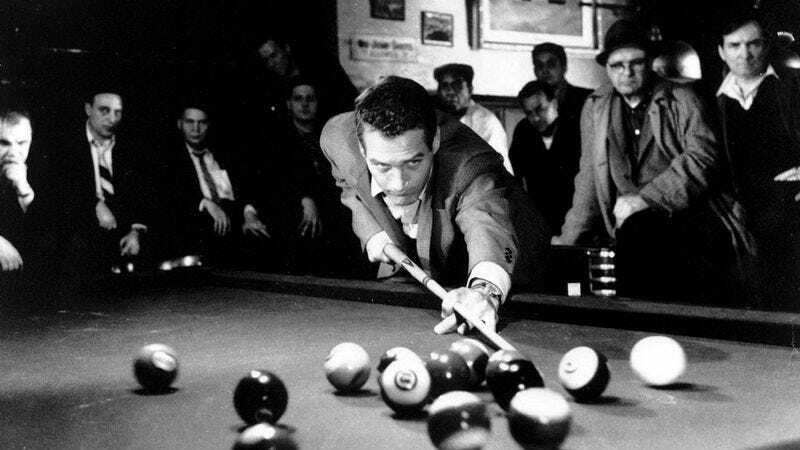 Hell, one can almost imagine Paul Newman’s hotheaded young pool shark Eddie Felson within the ranks of West Side Story’s white gang, The Jets. But in more fundamental ways, Rossen’s movie was the alternative—black-and-white to Story’s Technicolor, an intimate character study told on a small canvas. To vote for it would have been to vote for a different kind of Hollywood hit. And in 1961, when world cinema was evolving fast, its (impossible) victory would have seemed in sync with the changing face of the medium. But The Hustler requires no principled defense, no grading on a David-vs.-Goliath curve. It’s a miniature powerhouse of a sports drama, locating a harsh poignancy in the exploits of Fast Eddie, a charismatic hustler who loses big against an older, more patient pro (Jackie Gleason, who performed most of his own stick work), romances an alcoholic writer (Piper Laurie), and gets staked by a soulless high-roller (George C. Scott). By now, the story of a self-destructive loner wagering it all for pride and glory has hardened into genre cliché, with just about every gambling flick of the last five decades—including The Hustler’s official sequel, The Color Of Money—offering some variation on the fatalistic maneuvers of Fast Eddie. But none of those lesser descendants have robbed The Hustler of its hard-nosed poetry, partially because few of them seem as fascinated by the psychology of their anti-heroes. For whatever else he is—addict, egomaniac, “poolroom bum”—Eddie is also an artist, capable of identifying the gifts of his opponent. “Look at the way he moves, like a dancer,” he whispers of Gleason’s “fat man,” and Newman—young and brash, his eyes alight with fascination—makes the movie’s obsession ours. West Side Story, to be clear, is a marvelous confection; if awards must inevitably go to big-budget spectacles, let them go to ones as vibrant and stirring as Robert Wise’s Manhattan musical. But the film’s victory was a blow struck for artifice, for movies as escapism. The Hustler cuts deeper; it’s as entertaining, in its compact way, as West Side Story, while achieving a realism—of psychology and environment—that sears itself onto the brain. That’s truly Oscar worthy, for whatever winning an Oscar is worth. Availability: The Hustler is available on Blu-ray and DVD, which can be obtained through Netflix or your local video store/library. It can also be rented or purchased through the major digital services, and is currently streaming on Netflix.